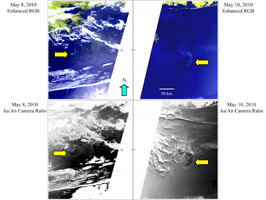 The Multi-angle Imaging SpectroRadiometer (MISR) instrument on NASA's Terra spacecraft passed over the Deepwater Horizon oil slick in the Gulf of Mexico on May 8, 2010, at approximately 16:50 UTC (11:50 a.m. local time), then again two days later on May 10 at 16:35 UTC (11:35 a.m. local time). 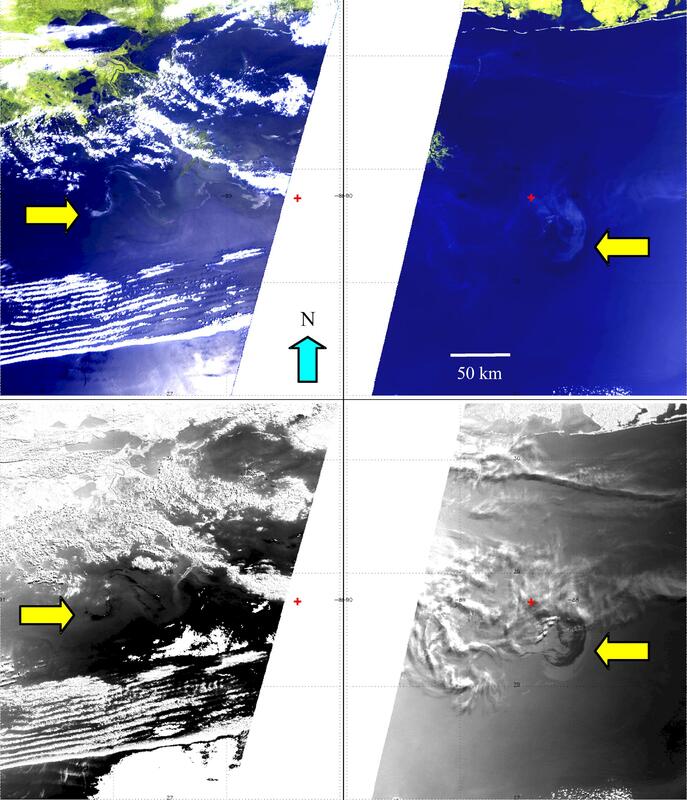 The top pair of images show enhanced "true color" images of the region on these days. The spatial resolution of these images is 275 meters (902 feet). 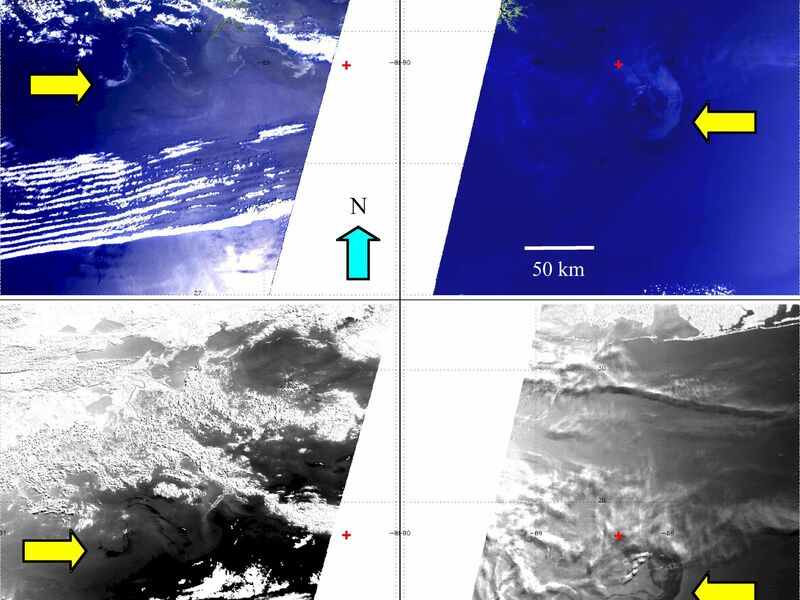 The images were created by combining the instrument's red, green and blue spectral bands with information from MISR's near-infrared spectral band, which is more sensitive to the presence of vegetation. This makes the shore along the Louisiana, Mississippi and Alabama coasts stand out more clearly. The Mississippi Delta can be seen in the upper portion of the image from May 8 (left) and Mobile Bay is located near the top center of the image from May 10 (right). The red symbol indicates the approximate position of the Deepwater Horizon platform and the source of the oil slick. On May 8, this position is slightly off the eastern side of the 400-kilometer (249-mile) MISR image swath. The yellow arrows indicate locations with high concentrations of oil on the surface. On both days, the oil is visible on the surface as slightly brighter regions within the darker waters of the Gulf. This is because oil on top of water suppresses small waves, changing the way the water surface reflects sunlight. In images like this, it is often difficult to distinguish the oil from sunlight reflected from uncontaminated water, called sunglint, which is visible along the right-hand side of the image on the left. It is also difficult to distinguish the oil from thin cirrus clouds such as those that are present along the center of the image on the right. 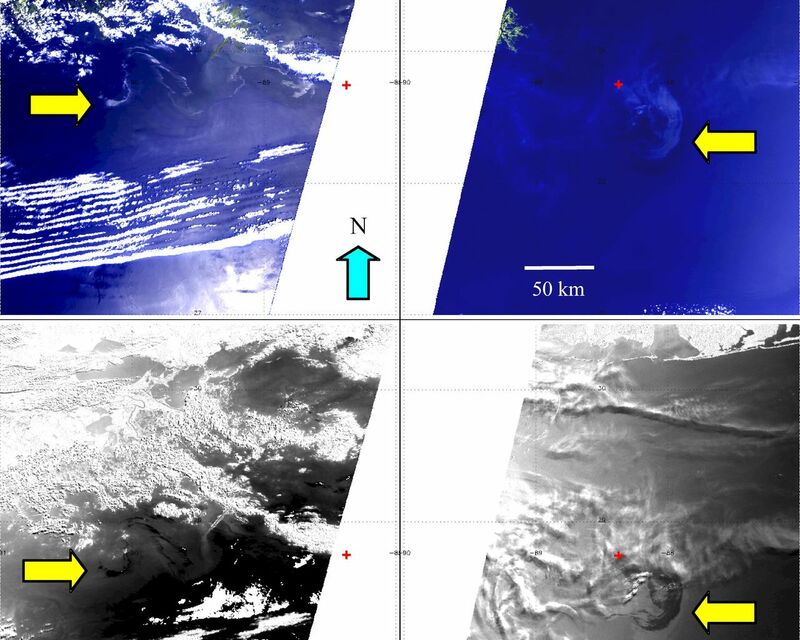 The lower pair of images are multiangle composites created by taking the ratio of the reflectances from the 26.1 degree aftward viewing (Aa) camera and the 0 degree nadir viewing (An) camera. In these images, the oil slick appears dark black against the lighter background of the uncontaminated water. Clouds and other features appear bright white. Thinner filaments of oil can be made out more clearly using this technique, although there is still potential contamination from sunglint, as seen along the eastern portion of the lower left image. 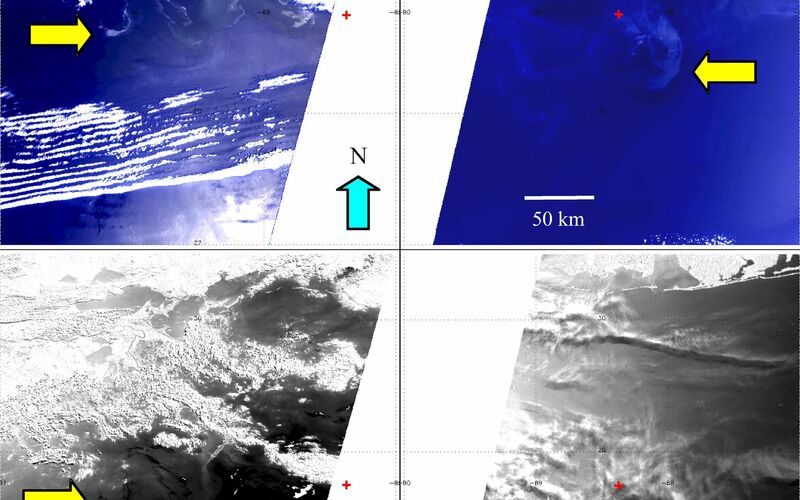 However, the multiangle composite does a good job revealing the oil slick near the source, even below thin cirrus clouds as seen in the image on the lower right.